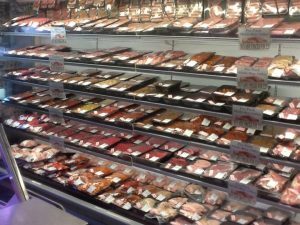 MULTIPACK – In 2009 we started a small area within the shop selling 5 packed meat products for £20, little did we know this ‘multipack’ offer would go on to become an integral part of our business. Whilst we still offer the traditional counter display, we now have two large multi deck fridges stocked with over 600 packs across 120+ product lines where the customers can mix and match any five for £20. All the packs are cut fresh daily meaning they are ideal for freezing down into portions when you get home. All of our customers comment regularly on the size, variety and quality of the packs.